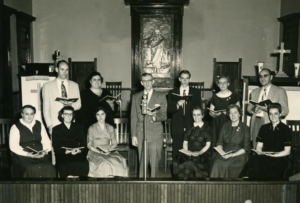 1952 – The Bethesda Mission Radio Hour begins broadcasting live every Saturday night on WHGB. Continues through the 70’s. Talented Christians from a number of different churches came faithfully each week to participate in our radio broadcast. The hymn, `Since Jesus Came Into My Heart,’ introduced `The Bethesda Mission Hour’ each Saturday evening.